« Instant Karma’s gonna get you, Comic Book style. KAPOW! Newest Military Secrets – the HORROR! A quote from the movie, Gladiator. I personally think it is also 5 words spoken regularly by employees at your local kids ‘FUNLAND’ each morning. I have an image of a group of pimple faced teenagers lined up and shuffling their feet nervously. At the glass doors before them is the chaotic horde of children waiting to be let inside.. the skinny guy in front of the entrance to the ballpit looks crazy with fear as his eyes dart back and forth scanning the room for another exit. It is only the steady gaze of the world weary, middle age, franchisee that keeps the troops together. Before panic can set in, she raises her hand in a defiant salute, “At my signal, unleash hell”. The doors burst open and the terrified teens try to control the raging, primal force that is contained in 2-5 year old kids..
Help! Help! 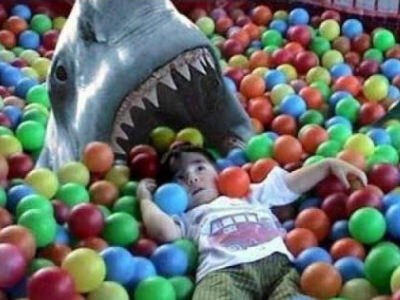 This child is attacking my shark! My idea is that it’s high time the Military made use of this unbelievable power. Kids are natural weapons. The military’s most unbreakable equipment will easily be smashed by a 6 Year Old boy. It’s really just a combination of determination and time. This is not a new idea. Consider all of the government funded ‘tests and injections’ a pregnant woman has to have.Could be that the doctors are undercover operatives for the mission of pre-programming our children with specific trigger codes set up in order to break down parents into financial and emotional compliance….. You assume that Sponge Bob is innocent but perhaps it is not so…. I consider the above to be far more likely than you being a ‘wimp’…. Perhaps you just need some soup..
EMAIL Me Updates – My Daily FIX! Hook Me up to Pat’s Blog!